The last time I ate tamarind was 1975. "White Christmas" began playing on the radios. It was the signal that the evacuation of America personnel had begun. Once Robert's family realized that the fall of their country was imminent, they and thousands of others rushed towards the American Embassy. Marines fought to keep the gates closed against the panicked tide of people desperate for the freedom their side of the gate represented. Hands and arms reached towards them, imploring; native voices pleaded with them to open the gates. Robert was 11 years old. He was at the gate with his mother, his father and his two sisters. The scene was one of madness, of chaos. The Marines were allowing only certain people in, those with the right credentials, those who had worked for the Americans, those whose lives were at risk if they stayed behind. When the gates opened to permit an embassy worker and her family through, Robert's mother took her chance: she knew the woman walking through the embassy gates. Impelled by the weight of the crowd, the gates bent momentarily inward and Robert's mother laid her hands on his shoulders and pushed her son through the gates. She screamed to the woman on the other side, begging her to take Robert. It was the last time Robert felt his mother's hands for fifteen years. When next they saw one another....they were strangers. "He's cold," I said to her, a little dismissively after he and I spent an afternoon roaming through the National Gallery. I warm to everyone. But nothing in his manner had invited familiarity. On a sunny June day, his coolness had washed over our excursion like an Arctic wind. "His mother says he's very aloof," said Mom. Then gently: "But he wasn't raised by her. He lived with other people. People who weren't his family." A little pensively: "I don't think they treated him well." There's a memory I have, of being at one of the refugee camps in Guam and accompanying Mom and Dad when they found Robert with the Embassy family who had taken charge of him. Being but five I had no concept of the enormity of his situation; I could not comprehend that Robert was essentially orphaned and dependent on the kindness of strangers. We were everywhere surrounded by shell-shocked refugees and survivors of a country no longer extant. My mother embraced him and asked him questions. He reassured her that he was all right. That family moved to Seattle while we settled on the east coast so we did not see him. "Why didn't we take Robert with us?" I asked my mother. Because she had the five of us, ranging in age from 5 to 2 months old. Because she and my father had no idea what would happen next. Like the thousands of their fellow refugees, they were without home, without country and without a plan. I wonder if I could have made the same decision Robert's mother made: to offer her son a free life, but one devoid of his family's love. My father once said to Uncle Mark: "It's worth it Mark, it's worth it to try for freedom." But I think too about what my life has been, embraced by the comfort of a large family; encircled in my mother's arms; and when I am ninety, I will still remember how my father's hands felt on my shoulders as he leaned down to kiss my head. I bought some tamarind at a farmer's market. 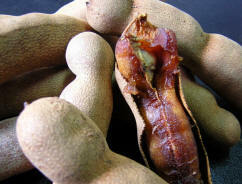 And this is what I remembered when I tasted it: there were tamarind trees outside the complex where my family lived. When we were children, Robert's parents would come to visit my parents and he and I would pick tamarind pods off the street and split them open, eating the sweet, acidic fruit. How bittersweet that taste now, how profound with loss. In my son's room, I hold my sleeping boy close to me and make him all sorts of promises...It's hard not to cry. OK, thanks for making me cry (really). It is good to be a little heartbroken sometimes I think. It can be the difference between complaining about ridiculous things and remembering to be so very grateful for what we have. Thank you for reminding me of that on a day when I was whining about my lot in life... which is actually really good. Best wishes. Hi Holly...oh yeah...I cried too. That taste memory just did me in. Thanks for dropping by. I also cried and at the risk of sounding too obvious, this is such a good example of the power of food and taste to transport us to different places. I'm always impressed at how food and memory and love are so intertwined. So much bitter sweet in this one Cath but thanks for the tear, joys always seem richer after a tear. Hopefully you will never have to make that choice Cath. We do what we think is best for our children but sometimes we make the wrong decisions. Thank you for sharing this poignant story. The saddest part is that families are still being torn apart in places rife with conflict. It is possible to sympathize with but impossible to grasp fully the "enormity" of such human tragedy, unless one has been victimized by war and forced to abandon one's homeland. This is my first visit to your site and I must say that you are not at all "one-dimensional" as you stated. It is truly refreshing to encounter writing of such depth and sensitivity. What an extraordinary post. Thank you.